This entry was posted in Friends and family, Knitting, Life reflections, Sock knitting. Bookmark the permalink. I love the Maestro Mitts. Alas, a quick Ravelry search does not turn up the pattern. Is it available? I’m sorry to be so long in responding—being a new blogger, I forgot about my separate blog-related mailbox. 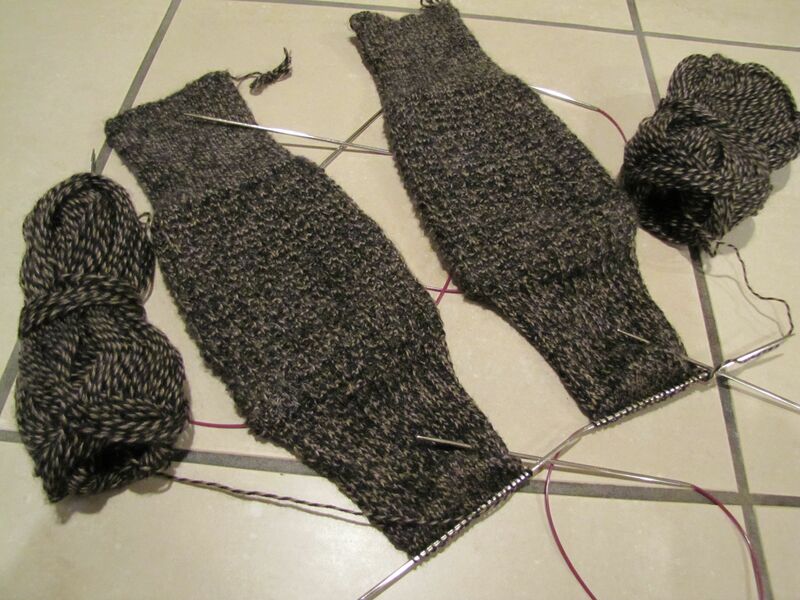 Geri, I loved reading the colorjoy entry about mending socks by using duplicate stitch. That’s a good method—and especially if handknit sock wearers keep an eye peeled for spots that are weakening a bit. I loved her use of various colors so that the mended socks would be even more colorful. Also, I share her joy at being able to rescue socks that would otherwise bite the dirt. I’ve often thought about it and wondered why I get so much pleasure out of rescuing them. I have concluded that refooting and mending and otherwise rescuing socks and other handknit items almost falls into the category of “survival skills.” And it feels so good to be recycling and keeping something going as long as possible in contrast to what is so often done in our disposable society. Thanks. I love your comments and the blog. Geri, thanks too for your caring thoughts about my mother. 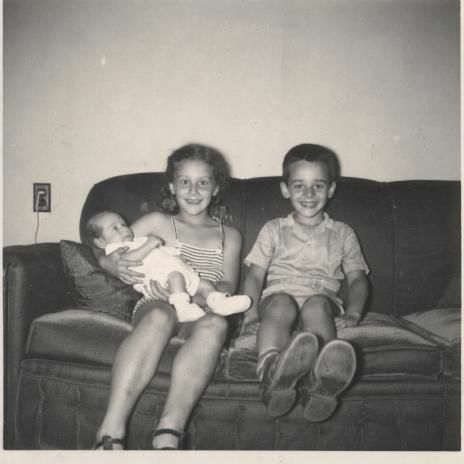 She always said she’d lived a life that was long, healthy and happy–and really did a good job of helping all of us understand that she felt her life had been good and that we celebrate rather than mourn when she passed. We actually did a little bit of both, of course! Those are the Sally Gloves, right? I am just hopping up and down in my chair right now of excitement!!! Yes, you’re definitely right. I love those mitts and have since given them to a close friend. I finally got my project up on Ravelry that tells the story of them being the last gift I knit for my mother—but wasn’t able to give them to her as she died this past November. Great design!! Nancy: Thanks1) for identifying the gloves — bought the pattern, just waiting for our 10″ of snow to melt (must be spring in Colorado) so I can go buy the yarn. These will be perfect for my niece at Phillips Andover Academy in Massachusetts and Thanks 2) for introducing me to a new blog — yours! Yup, they’re “Fingerless Glove Sally,” a great pattern designed by Nancy Ricci. You can buy it from her at her website, “Getting Purly With It,” or from Close Knit on NE Alberta Street in Portland, OR, where she used to work before moving to the SF area. I like this pattern. It is attractive and was quick to knit. I embellished it with stacked buttons that I purchased at Stitchcraft in Vancouver, WA. 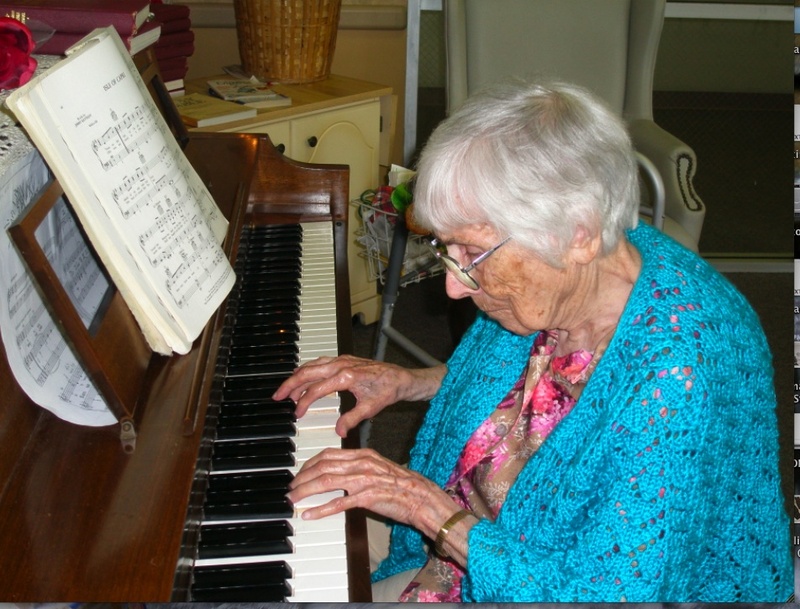 I love that photo of your mum at the piano. 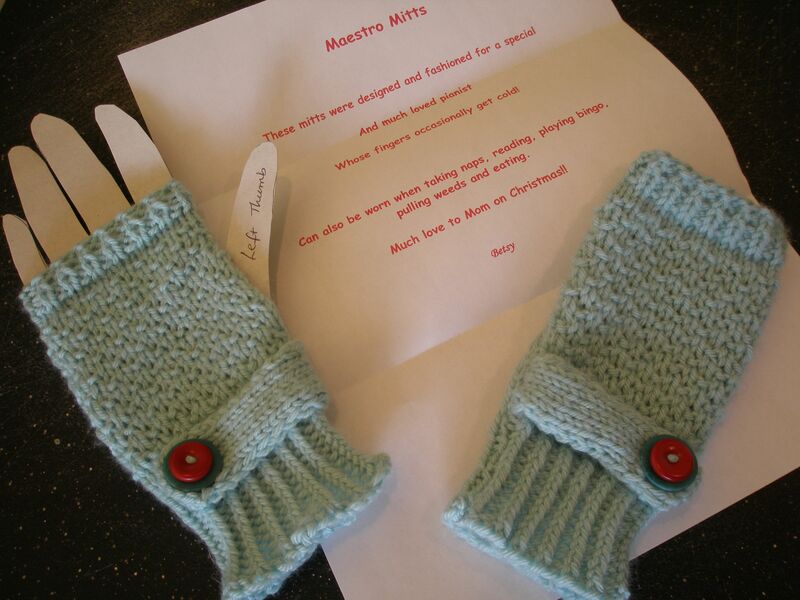 And the mitts with the lovely note – sniff. Great post, Betsy! I am so excited to find a designer/knitter that blogs on a regular basis. Yeah! I’ll be right here to read every post. By the way I blogged about you on my blog today. Great. It’s taking me a bit to get going—-maybe I’ll do more than one blog in a week. But, as you will learn if you follow me, I tend to be unrealistic about how long it takes to do things! Thanks for the encouragement! My Mom just emailed me the link to this blog entry. I’m not quite sure who she saw more in it – herself or me. I don’t remember putting papers under the sofa cushions, but I have definitely loaded my dryer and dishwasher with papers, fabric, whatever was still laying around as I was pulling food out of the oven and frantically wrapping (usually finished) gifts I’ve made as my guests pulled in the driveway. It’s a wonderful life. Suzy, I love your story, and you and your mother are so very creative! It never occurred to me to put anything except clothes and dishes in the dryer or dishwasher. What a lack of imagination on my part!! I can’t say on my mother’s, too, because she didn’t get her first dishwasher until I’d left home and the washer and dryer were located in a room at the back of the house—way, far away from the upside down living room! Thanks, Linda. I, too, have also promised gifts that were never delivered, and it’s OK and life goes on!